I visited the Nest Bedding Factory on 10/9/17 and took a photo of the cover on the Nest Bedding Alexander Signature Hybrid. You can see that the color has changed a little bit, and that they have added handles to it! We have been thrilled with the Nest Alexander. It scored perfect marks for: comfort, support, edge support, motion transfer and sleep quality. The shipping time was great, but just a little thing on the box. Why no handles? Usually boxes come with little indentations that you can push through and then use as a handle to lift. Neither the Alexander nor the Activex have handles so moving the boxes around is somewhat more difficult. I had a phone call with Joe Alexander from Nest and he filled us in on why they don’t use handles. It’s more of a safety thing than anything else. They found that handles aren’t secure enough for a box this heavy. People could drag the box up the stairs and then the handles could snap off and send the box down the stairs and the user crashing back on the stairs. Seriously, the only complaint that I have for the Alexander is the boxing? 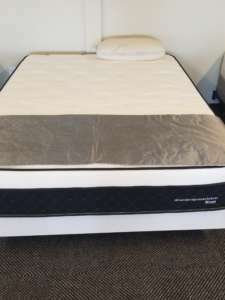 Otherwise it is the best hybrid mattress that we have tested out so far. Below the construction of the Alexander Signature Hybrid mattress and what makes it so “cool”- literally and physically. 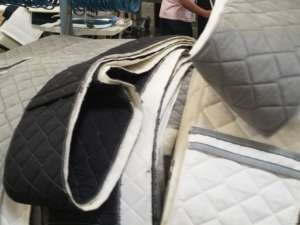 2″ of Soft Quilted Foam covered in cool sleeping stretch fabric, designed to improve air flow as well as pressure relief points between your body and the mattress. Without forgetting the floral design itself that’s visually very appeasing, so classy yet smooth and soft to the touch. 2″ Copper Infused Gel Foam, that’s the layer where copper and gel foam together play a solid role of keeping the surface cool while the heat of the body stays away. 2″ density SmartFlow Foam is another layer that besides offering even more cooling, it provides great transitional support. Now the most important layer in every mattress we test (at least to me personally) the base, the foundation layer with its 7″ Zoned Edge Support Pocketed Coils- what makes it such an amazing hybrid mattress right there, providing even balance, cooling and support to the sleeper. Between the pocketed coils and all foam layers the Alexander Signature Hybrid mattress carries the best of both worlds. For fun I shot a video comparing the Nest Bedding Alexander Signature Hybrid to another Nest Bedding product, the ActiveX, enjoy! Save $150 Off the Alexander Hybrid with Coupon Code: OMG150 – Shop for your Dream Bed at NestBedding.com!